The problem with traditional 2D CAD is that you sometimes lose touch with the overall design because you are forced to think from the perspective of flat construction documents. The restrictions of the documentation requirements and the technical limitations of the software take priority over the design itself. Designing in 3D gives you the freedom to visualize how the project will look in real life. The design becomes the primary focus, and the construction documents become a by-product of the design. That is the way it should be. There are plenty of 3D design programs out there that automate much of the process of designing a building, but you sacrifice the design once again because you are forced to learn and abide by complicated technical processes in order to get the software to do what you want. Creating anything custom further complicates the process, or is simply not possible. Where SketchUp shines is in its ability to create accurate 3D models quickly in an easy-to-use interface without forcing users to learn complicated tools or workflows. SketchUp has a unique way of prioritizing the design, and LayOut provides the conduit to communicate your design on paper. In SketchUp & LayOut for Architecture, you’ll learn a step-by-step workflow that will enable you to eliminate CAD from your workflow, focus on your design, and produce beautiful construction documents for each phase of design, including Schematic Design, Design Development, and Construction Documentation. Completely change the way your construction documents look by adding color and textures to illustrate the building materials. Introduce fog and shadows to portray a sense of depth in your viewports. Emphasize important elements using vector rendered linework viewports. Do all of this using only SketchUp and LayOut. 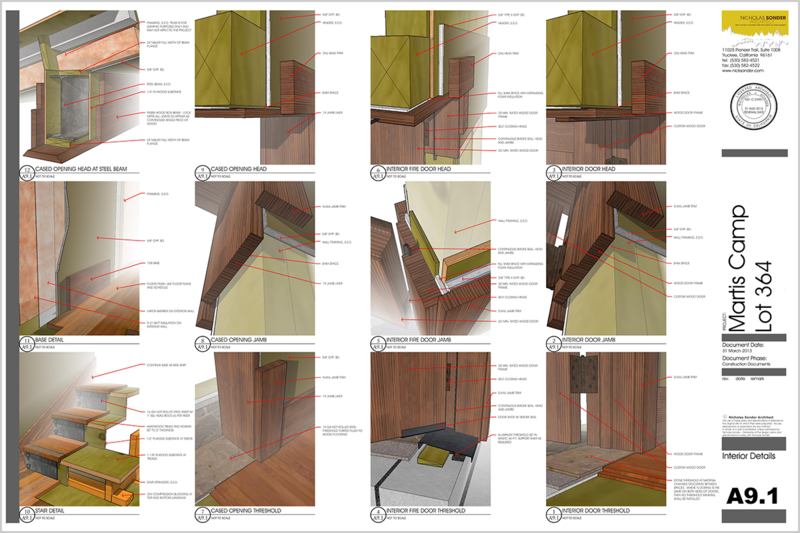 Fully illustrated construction documents not only look great, they communicate more clearly. Your clients, building officials, and construction team will appreciate how easy it is to interpret your drawings which means you’ll experience faster approvals and fewer questions in the field. SketchUp & LayOut for Architecture was co-written by Nick Sonder and Matt Donley. Nick is a leading architect who made the switch from AutoCAD to SketchUp & LayOut over 10 years ago. He has pioneered many techniques and styles in order to refine the entire design process. 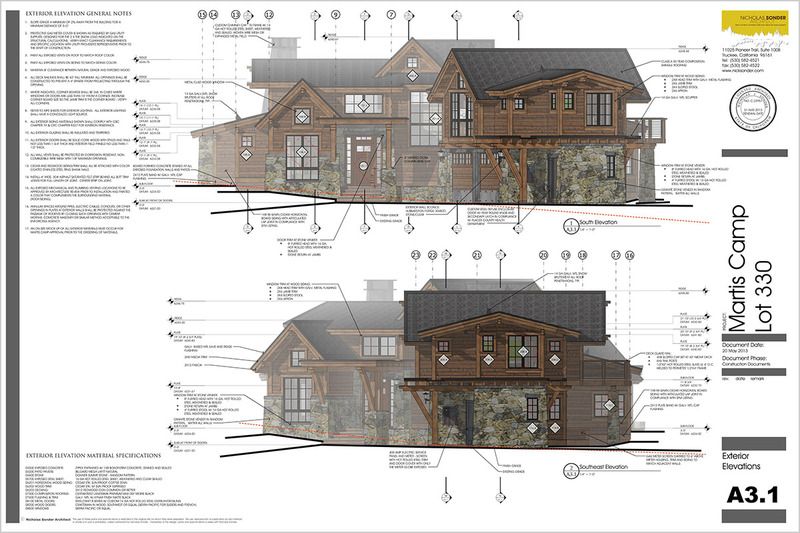 His workflow has been featured in numerous SketchUp videos, highlighting the custom residential homes he designs in Truckee, California. Matt Donley is the founder of MasterSketchUp.com, and the author of the book, SketchUp to LayOut. He has taught hundreds of thousands of people how to use SketchUp through his online tutorials, in person classes, and one-on-one training. Nick and Matt teamed up in order to deliver Nick’s entire workflow and processes in this book. SketchUp & LayOut for Architecture is the result of the collaborative efforts of two leading SketchUp experts through countless phone calls, emails, screen shares, and years of work. Your clients will visualize your design with more confidence and understanding when you use SketchUp. Navigate through the model with your client in real time with an accurate depiction of materials and space. Eliminate the need for interpreting 2D plans, show them what it will really look like using the 3D model. Take more risks with your design knowing that the client truly understands the design intent. Designing in SketchUp forces you to construct the building digitally before producing the construction documents. Since all of the construction documents extract views from the model, you know that the drawings are coordinated properly. Become more confident in your design knowing that there won’t be any conflicts in your construction documents. Instead of interpreting symbols and hatching, provide the construction team with detailed 3D perspectives of assemblies and details. Your details will be easier to understand, saving time during construction and eliminating the need for clarifications. This workflow is implemented without any special plugins or complicated layering systems. Retain full control over how you prefer to organize your models. Adapt the workflow to fit your own needs. With the SketchUp & LayOut for Architecture workflow, your projects will be organized in such a way that enables you to make fast changes to the design throughout the entire project. You will learn how to define the level of detail you should be modeling at in order to communicate your design clearly while providing the flexibility to make fast changes to the model and documents. All of the projects photographed below were designed and documented using the exact workflow and templates included in this book. These were all designed using nothing but SketchUp and LayOut. This book represents 10 years worth of knowledge using SketchUp and LayOut on real projects. While some SketchUp plugins and workflows require you to follow strict layering structures or even take control over certain fundamental aspects of SketchUp, this workflow puts you in control and gives you the freedom to customize to your own preferences. You can choose to follow our workflow to a tee, or you can take the underlying principles and adapt them to your own needs. Don’t add unnecessary complexity to your model in order to fit someone else’s system. The best part about SketchUp is its simplicity, and you won’t have to sacrifice that to implement this workflow. Not only will you learn how to implement the same workflow Nick has developed over a decade of using SketchUp and LayOut, but you will receive his complete set of SketchUp and LayOut templates so you can implement the workflow immediately. Instead of creating your files from scratch, just customize the title block to match your company information and begin your next project. In the SketchUp templates, layers and scenes are preset, saving you a ton of time and helping you organize your models. Customize the templates to fit your preferences while following the principles outlined in the book. Don’t sacrifice what’s important to you by using complicated systems that force you to use a specific layering structure or take control over certain functions of SketchUp. Use the complete sample project to discover how the models are organized. Extract components from them to start your own component library. Although this book was published during SketchUp Pro 2016, the book is still very relevant. There are a few features introduced in newer versions of SketchUp and LayOut that will make your workflow more efficient. In LayOut, there is now a Table tool, which lets you create native tables inside LayOut, linked dynamically to CSV files. This is an alternate method for creating schedules in LayOut compared to the method described in the book. The other major updated feature is the Section Fill tool. Now, the section tool will fill areas of the model it cuts through with a solid fill. 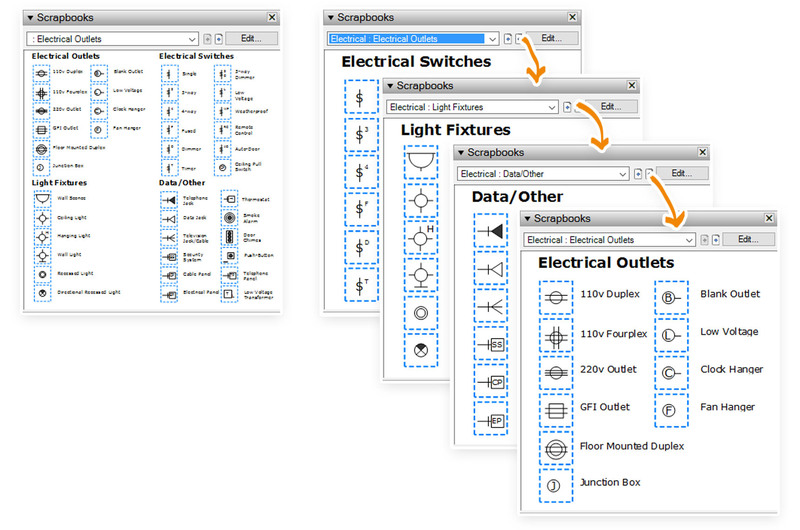 This gives you yet another option for preparing scenes for LayOut in addition to the methods described in the book. Aside from that, most everything has stayed the same in regards to how to apply what you’ll learn from this book. Building Model Template – This is the main model where you model the building, and prepare floor plans, exterior elevations, and perspective scenes. Site Model Template – All terrain modeling and site survey entities are placed in this model. The building model is imported into the site model. All site plan scenes are prepared in this model. Reflected Ceiling Plan Template – The building model is imported into this model to prepare reflected ceiling plans. Sections Template – The building model is imported into this model to create additional sections and scenes. Interior Elevations Template – The building model is imported into this model to prepare interior elevation scenes. A completed, real-world project is provided for you to explore and extract components from. Follow along in the book to discover how the models are organized and set up for LayOut. Schematic Design Models – Includes a schematic building model, existing site model, and schematic site model. Design Development Models – Fully detailed building model and site model. A great resource for starting your own component library. Construction Documents – A complete set of construction documents with notes, schedules, and legends for you to copy into your own projects. *Detail & assembly model library excluded from sample files. See what's packed into the book, and read the introduction. The secret behind the workflow in this book is to split your project into multiple files in order to simplify and standardize your process. Dedicate a specific model for preparing certain types of scenes and free up space in your main model. Although you are using multiple models, all of the coordination is still completed in a single building model. That building model is imported into other models to prepare specialized scenes. You enjoy the benefits and confidence of coordinating your design in a single model, while not having to deal with the frustration of trying to manage too many scenes, layers, or section planes. Master the SketchUp Sandbox tools and create a 3D terrain of your site by importing your site survey directly into SketchUp. Learn how to create terrain from contour lines, drape roads onto the terrain, and alter the terrain with your own grading. Add 3D trees and vegetation to your model for enhanced visualization and accurate landscape plans. Learn how to create door and window schedules from directly inside LayOut. The book includes a set of LayOut schedules that you can copy and use on your own projects. Learn how to create your own custom detail and assembly models. Organize them inside of a custom scrapbook for easy access. Reflected ceiling plans can be challenging to configure in SketchUp. In the book, you’ll learn how to use a dedicated template model to import your main building model into and prepare scenes just for reflected ceiling plans. One of the best ways to save time and be able to make quick changes to your design is to model at the correct level of detail. In the book, we teach you how to identify the correct level of detail to model at through numerous examples and step-by-step instructions. Learn how to create and optimize your own scrapbooks to reduce redundant work. Include symbols, text, and even viewports in your scrapbooks to further enhance your workflow. Sample project including detailed building model, site model, and complete construction documents in LayOut. Paperback & Ebook Most Popular! For any questions regarding the packages above, don’t hesitate to email us at support@mastersketchup.com! Which rendering program do you use? The images you see on this page are actually photographs of projects that Nick has designed and documented using the workflow in this book. We show them to you to illustrate the fact that this is a real workflow that is used on real projects. The photographer is Vancefox.com. Nick does use LumenRT to create renders and live animations of his house models. Are the templates and sample files compatible with my version of SketchUp? Upon checkout, you will be forwarded to a page where you’ll be able to download 2016 versions of the sample files and template system. If you have an older version of SketchUp, you’ll be able to download files compatible with 2013 and newer by clicking the link provided in your purchase confirmation email. How do I get the sample files and template system? The books are printed on demand at one of three printing hubs (US, UK, and AU.) Your book will print from the closest hub and ship directly to your door. We ship internationally to most countries. Are the templates available in Metric? In the LayOut templates, the dimension tool is set by default to feet & inches. You simply need to select a different unit before creating dimensions and the template will work in metric. The SketchUp files are independent of unit, as you define the unit as you are modeling. Are there any plugins required for this workflow? You do not need to use any plugins to implement this workflow. We do recommend a handful of optional plugins throughout the book, but they are not required. Any plugins you currently use to help you model can work seamlessly with this system. How do I get the detail models? The detail models are not included with the book. Shipping times vary depending upon location. With 3 printing hubs located around the globe, most books arrive within 1-2 weeks. We will make sure to choose the printing hub closest to your location to minimize the amount of time it takes to get to you. Australia arrives within 12-15 business days because the books ship from the US. Do I need SketchUp Pro to use this book? Yes. This book provides a workflow for creating SketchUp models and organizing them in a way that they can be easily sent to LayOut for 2D documentation. In order to get LayOut, you need to purchase SketchUp Pro. You can purchase SketchUp Pro at www.sketchup.com. Do I need to read your first book? SketchUp to LayOut is a beginner’s book that focuses on LayOut specific tools, and its relationship with SketchUp. It’s a universal guide that can be applied to any type of 3D modeling. This book is more of a step-by-step approach for custom architecture. It specifically focuses on a proven workflow for architects. What experience level is needed? You should know how to create basic shapes in SketchUp, and understand how to organize objects using groups & components. If you’ve only opened LayOut a couple of times, you should be ok, but I’d recommend also purchasing my first book SketchUp to LayOut to get you familiar with the entire LayOut interface. Do you provide bulk/educational discounts? Use coupon code BULK20 for 20% off purchases of 2 or more. Email support@mastersketchup.com for more information on educational discounts. The paperback is an 8″x10″ book with 340 pages, printed in full color with over 330 images and illustrations. The PDF version is about 100mb, with a bookmarked table of contents for easy navigation. Is this book available in my language? Currently, SketchUp & LayOut for Architecture is only available in English. If you purchase a package from me and find that it doesn’t live up to your expectations, simply write me an email at support@mastersketchup.com and I’ll issue you a 100% refund on your purchase. If your package includes the paperback version of the book, just pay return shipping. I want you to be completely satisfied, nothing less.